Cool continuation of the sidetrek, with bonus critter! This can be used as a sequel to the previous mini-dungeon “When goblins die, no comets are seen“, though it can also be used on its own. The very entrance to this complex is dangerous, potentially beginning with short-term madness, establishing a sense of foreboding dread that the complex then manages to expand – from traps with insanity mist to cairnwights and gray oozes, the caverns contain some nasty tricks; and yes, burrowing can actually yield treasure…if you know where to look. Moreover, some nonmagical, but potent equipment with unique properties can be found, a big plus for me! Pretty cool: The mini-dungeon contains 2 nice little random events to keep up the pressure….and in 5E it comes with the full stats for the elder thing, a neat challenge 5 critter – big plus here! 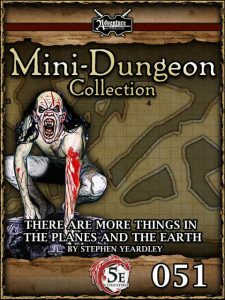 Stephen Yeardley’s exploration of these realms below is interesting and the challenges and obstacles faced are fun and create an interesting mini-dungeon, well worth a final verdict of 4.5 stars; the conversion goes the extra mile with the cool monster and items – which is why I will round up for this one. Well done, whoever handled this one!